Ashley Capital has become one of the largest privately-held real estate investment companies in the United States. They recently added the Livonia West Commerce Center to their portfolio of 23+ million square feet. 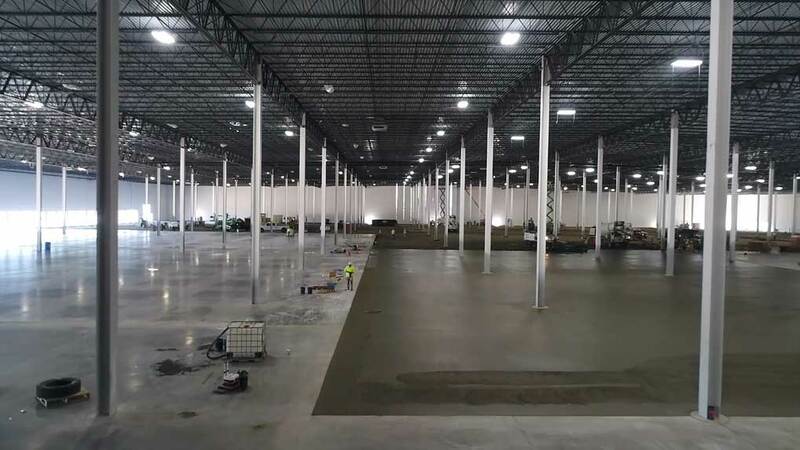 The Gilardone Company, the concrete contractor for this project, realized that placing traditional steel reinforcement across 1.1 million square feet would require a crew of workers and several weeks of time. Instead, the Gilardone Company turned to Helix™ Steel’s patented Helix™ Micro Rebar to reduce the construction schedule and provide Ashley Capital with a superior performing and more durable floor. Ken Bowen, VP of Construction at Ashley Capital states, “Ashley Capital was facing an impossible schedule given traditional construction methods using welded wire fabric but with Helix we were able to meet the schedule and provide a superior product for a knowledgeable and fast-moving tenant”. Helix was able to fully replace all of the WWM reinforcement for each SOG application with a Helix Micro Rebar dosage of 9 lbs./yd3. For additional information on the engineering performance of Helix® reinforced slabs and hybrid slab systems, please contact our engineers, Wicke Herfst Maver Consulting Inc. (604)484-2859. Site Map | Contact Us | (604) 227-3874 | 2018 © Steel Fibers West | All rights reserved.